The 2015 Japanese National Carcass Competition winner is a 'master class' the value of breeding and feeding to the genetic potential of the Japanese Black. Overall, the 30moa champion steer carcass graded JMGA A5. 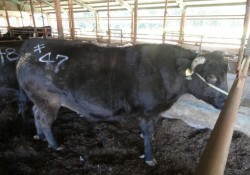 The Japanese Black calf market is very buoyant due to livestock shortages, with strong carcass prices driving high demand for replacement feeder cattle. Japan's English-language web agri-newspaper reports that local prices of stock feed skim milk powder (JP¥10K/1kg) have hit record highs, where they are projected to remain, with a 'grave impact' on the Japanese Wagyu calf feeding industry.